Sayed Ali Sadr Hasheminejad. Right: Keith Schembri. The Prime Minister’s chief of staff, Keith Schembri, was one of the few Maltese guests at a small wedding of Sayed Ali Sadr Hasheminejad, the owner of Pilatus Bank who has been arrested in the US over alleged sanctions-busting and money laundering before 2013. Mr Schembri’s attendance at the 2015 ceremony in Italy, said to have been organised for close friends and family, is significant in the light of a financial intelligence report describing his “high level of familiarity” with Mr Hasheminejad, who was last week ordered to quit as chairman of the bank by the financial services watchdog. 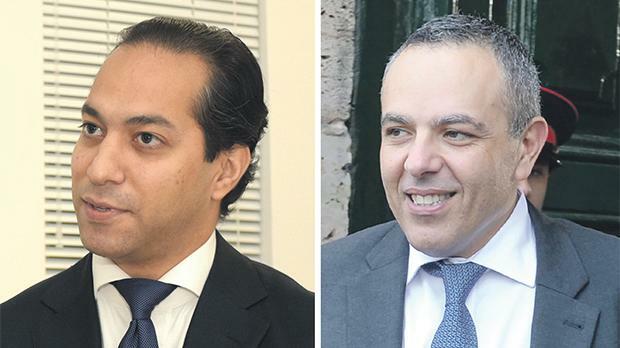 In a report leaked in 2016 outlining suspicions of money laundering and receipt of kickbacks by the chief of staff, the Financial Intelligence Analysis Unit said Mr Schembri has a close association with Mr Hasheminejad. “It was not clear whether there are business links between the two individuals but according to unconfirmed sources, there appears to be a high level of familiarity,” the leaked report said. Asked yesterday to confirm his presence at the wedding in Venice and to explain his close friendship with the Iranian-born Pilatus owner, Mr Schembri confirmed that he attended but declined to elaborate on the level of friendship between the two. “Yes, I was invited and attended the wedding together with many other Maltese and foreigners,” Mr Schembri told The Sunday Times of Malta. “Incidentally, I recall being seated shoulder to shoulder with a sitting director of the Allied Group (Austin Bencini), which publishes your newspaper,” he added. Leaked FIAU reports show the Prime Minister’s right-hand man owned an account at Pilatus Bank. The anti-money laundering agency concluded a suspicion that the account was used for money laundering and receipt of kickbacks from passport sales, in association with Nexia BT’s Brian Tonna. Although passed on to the police, no charges have so far issued against Mr Schembri. In another damning report, the FIAU also found “reasonable suspicion of money laundering” with regard to transfers of money from Mr Schembri’s Pilatus account to the accounts belonging to the former Allied Newspapers managing director Adrian Hillman. This report was also passed on to the police for further investigation but has so far not resulted in any arrests. Last May, following the publication of the FIAU reports, Times of Malta revealed that Mr Schembri and Mr Hasheminejad used to dine frequently at Sciacca Grill restaurant in Valletta, which used to form part of Mr Schembri’s personal business portfolio. When asked, Mr Schembri had admitted he used to meet the Pilatus Bank owner but played down their familiarity. Denying that he had taken personal interest in the licensing process, Mr Schembri said they had dined “on one or two occasions at best”, adding that as the Prime Minister’s chief of staff, “I do take an interest in all investment opportunities”. After his arrest in the US, Mr Hasheminejad was charged with participation in schemes to evade US economic sanctions against Iran. US prosecutors in a Manhattan federal court are claiming that he funnelled more than $115 million from a Venezuelan-Iranian housing project through a complex financial set-up that circumvented US sanctions on Iran. Allied Newspapers Ltd director Austin Bencini declared he attended the Pilatus Bank chairman's wedding in 2015 in his “private capacity”.